MTM is On the Move to the Aloha State - MTM, Inc.
MTM is excited to announce that we recently launched our newest On the Move program in Honolulu, Hawaii. Following a competitive bidding process, the Department of Transportation Services (DTS), which serves the city and county of Honolulu, selected MTM to operate its Americans with Disabilities Act (ADA) Paratransit Eligibility In-Person Assessment Program. Through its ADA paratransit service, TheHandi-Van, DTS provides complementary paratransit to individuals with disabilities who are unable to safely and independently utilize fixed route public transit. On behalf of DTS, MTM manages all day-to-day activities of TheHandi-Van Eligibility Center, including providing in-person assessments for ADA paratransit eligibility to determine if applicants qualify for the service. The $3.5 million contract, which began on January 23, holds an initial term of three years, plus two option years. On an annual basis, MTM anticipates performing approximately 4,300 eligibility assessments and certifications. Our Honolulu operations are led by Program Manager Diana Do, who joined MTM in 2017 and was most recently a Supervisor for our eligibility assessment program with Access Services in Los Angeles, California. Diana’s local team includes three Mobility Assessment Evaluators who perform eligibility assessments, as well as two Administrative Assistants. This new program represents MTM’s fourteenth On the Move paratransit eligibility assessment, and our first contract outside of the continental United States. 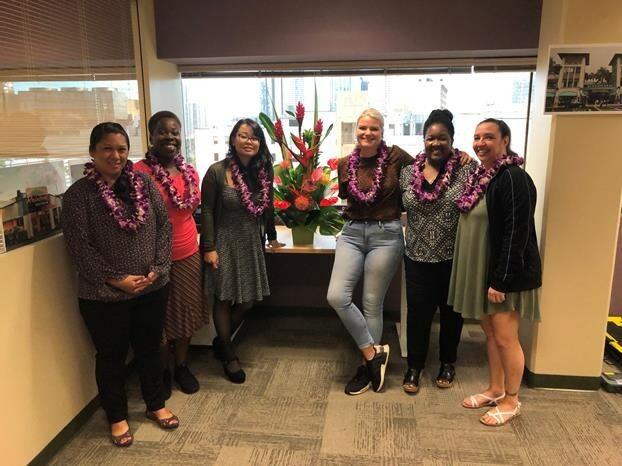 Say aloha to our Honlulu team, pictured from left to right in the photo above: Shanntel Napoleon, Paula Cox, Diana Do, Reagan Watts, Tarole Watts, and Rene (Malia) Stone. Congratulations on a successful go live!